Wagamana can do it. ITSU can do it. You can do it. No, I am not suggesting you sell up and risk all to start your very own Japanese healthy food outlet, but knock up, in next to no time at all, some delicious and nutritious meal which you can assemble, in next to no time at all, for less than half the cost. As I am home-office based most of the week, and live in a very rural location (I am not grumbling, really), my choices to nip out to and grab a bite is really limited. The one and only thing I enjoy about being in London (apart from seeing friends who chose to make that mad house their home) for two days a week is that I can get some quick and quality lunch that is certainly a lot more interesting and wholesome than your standard sandwich-related fayre that is so often saturated with cheap industrial-quantity mayonnaise. In my ‘hood, I am surrounded by fields, trees, horses (none of which are considered cooking ingredients- even though I am half-French), and a local pub which, whilst OK, exhausted its menu about 2 years ago and struggles with serving customers at a particularly modest pace. Same-day service sometimes feels like a pipe dream. Whilst exaggerating (as always), it is not so bad, but pub grub is not something my already far from athletic build should consume with regularity, and I really do bore easily of the same old, same old. Variety really is the spice of life. This is not my first rodeo insofar as a Japanese beef and noodle soup is concerned – as an alternative, please have a look at my Chilli Beef Ramen Soup recipe – this recipe, however, does not require any obscure or specialist ingredients which can be a little more challenging to source if not living in a large city blessed with amazing specialist ethnic or oriental food stores. Even Amazon has been known to fail me. 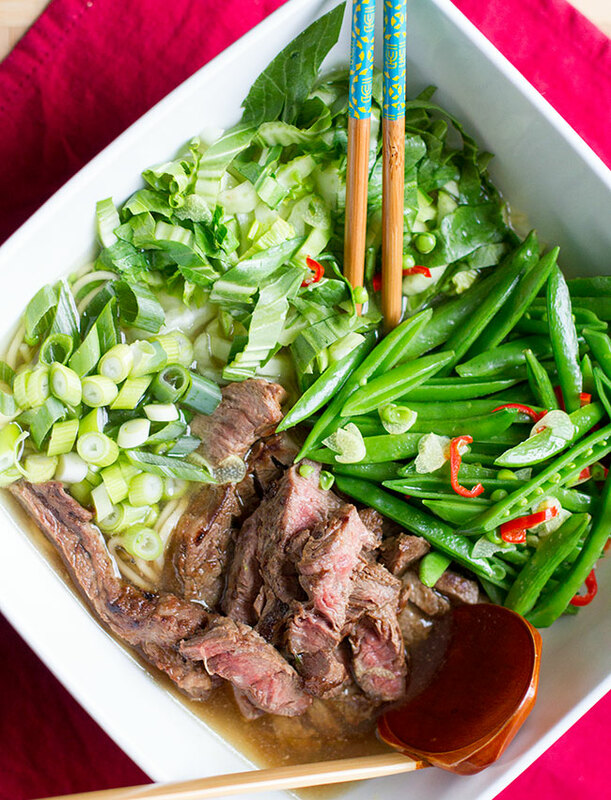 This simple beef and ginger noodle soup is so easy to prepare, and beats anything whipped out of the freezer under the guise of ‘convenience food’ I assure you. Finally, please accept my apologies for the hiatus since my last post- I really am one busy boy these days. First, trim the steak of any fat or sinew. Combine the soy sauce and grated ginger, and rub into the steak. Cover with cling film and allow to marinade for 20 minutes, or up to an hour if you can wait. Bring a large pan of slightly salted water to the boil, and cook the noodles until al dente. Drain, and rinse with cold water. Set aside. Bring a skillet/ frying pan to a medium high-heat, add the olive oil, and cook for 2-3 minutes each side. Remove steak from pan, and wrap in tin foil. Set aside for the steak to relax. Meanwhile, bring the chicken stock to the boil, add the caster sugar, garlic and chilli and continue to simmer. Add the noodles to the serving dish, then carve up the steak and place the steak on top. Arrange the sugar snaps, shredded pak choi, and sliced spring onions around the steak. Carefully pour over the stock, and serve immediately. When draining noodles, I always tip the water into the dish I am serving from to warm it up. I personally prefer the crunch of raw pak choi, sugar snap peas, and spring onions. Should you prefer to have them a little softer, add the to the stock for a minute or so before serving. As an additional flavour, why not try adding a stick of lemongrass to the stock, and remove before serving? So happy to see another post from you! What a beautiful bowl of soup – looks so comforting. I’m just starting to try out recipes like this, so definitely bookmarking. Thank you for your kind words. I have just revisited http://www.girlgonegourmet.com – believe me, bookmarking fellow food bloggers I admire is definitely reciprocal. How I wish I had the momentum to be as prolific as you! All best. Richard. Good wholesome tasty food. This is great! Looking back it is a god while since I last made this – your recent comment has inspired me to make it again.